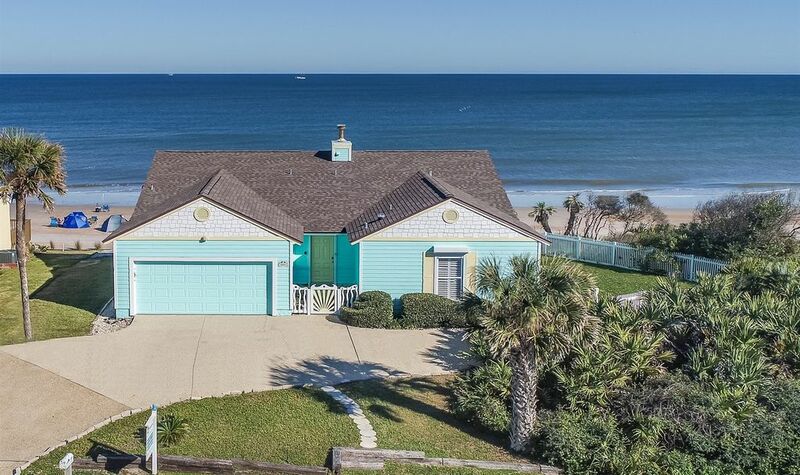 Sandpiper's Nest is a beautifully decorated, oceanfront, 3 bedroom, 3 bath home on a high dune in the oceanfront community of South Ponte Vedra Beach, between Jacksonville and St. Augustine. Located in a very private area of single family homes (no high rises or high traffic here! ), it is serene and quiet....yet the house is just 5 miles from historic St. Augustine and 15 miles from posh Ponte Vedra. Decorated in an upscale cottage style, with ocean colors, vaulted wood ceilings, and top quality furnishings, Sandpiper's Nest will quickly feel like 'home'! The spacious living-dining-kitchen area is open to the views of the deck , sea wall, beach, and ocean beyond. A large ocean front master suite has a king bed, day bed (with removable railing), desk, wall mounted TV, and a private bath with walk in shower. Two additional bedrooms and baths provide privacy for everyone. The large deck, gas grill, beach chairs, towels, and umbrellas are just a few of the many amenities we offer in this luxurious ocean front setting. We have a small screened porch on the north side of the deck, providing a lovely space for enjoying the outdoors in rainy weather or when you have had enough sun for the day. We have a gas fireplace for winter guests (Christmas through February) and a fenced yard for dogs! The living-dining-kitchen area is open to the views of the deck , seawall, and the beautiful ocean beyond. Comfortable seating, a fireplace for our winter guests, large flat screen television and DVD player, Bose CD player, books, puzzles, and games will insure that our guests will remain entertained, even on our few rainy days! We have a high speed wireless Internet connection so bring your lap top and surf the net throughout the house and the deck. The dining table easily seats 6, and four comfy bar stools at the long kitchen counter offer additional dining space. The galley kitchen is lovely, with granite counters, large refrigerator, glass top electric range, oven, microwave, toaster and toaster oven, dishwasher, and all the other conveniences that make cooking a pleasure. We also have an extra refrigerator in the garage. The kitchen is situated in the heart of the living area, with no walls to obscure the views of the living and dining areas and the wonderful deck and ocean beyond. The master suite is a peaceful retreat. Located on the ocean side of the house, it contains a king size bed with top quality bedding. The room has a private bath with walk in shower, a large wall mounted TV/DVD player, and a desk for computing or other work. We also have a day bed in the master, which is perfect for lounging or for a toddler. The junior master is on the front of the house and is equipped with a queen size bed, vaulted ceilings, large wall mounted TV, and a private bath. The bunk room is a child's delight. The bed will sleep 3, thanks to the trundle underneath, and the mattresses are regular single mattresses so are comfortable for adults as well as children. This room also has a TV/DVD. A full bath is located in the hall adjacent to this room. You will love the hurricane shutters we have installed on all of the doors and windows! If you like to sleep in a DARK room, just push a button and there you are. The deck is a destination in itself. Running the length of the house, the deck is 12 feet deep, providing lots of space for play and relaxation. Furnished with a round umbrella topped dining table and many comfortable chairs and loungers, the deck is a delightful spot to read, snooze, or dine. The deck railings have horizontal cables close together so that small children are always safe, and a lockable gate insures that they will stay on the deck. The cables also allow for unobstructed ocean viewing. We have just completed a spacious sea wall which runs the length of our 90 foot property and is "decorated" with beautiful flowers and plants. In September 2018, the "wall" will be covered with salt tolerant grass and "yard chairs", allowing for additional outdoor space. We have recently fenced in the yard on the south side of the house with gate access to the deck. This is a perfect place to let your dogs run free and take care of business without your having to walk around in the night! Other amenities include: optional temporary beach club membership, double garage; water softener; indoor laundry plus additional units in the garage; two refrigerators; gas grill, beach chairs, umbrellas, towels, toys, 4 TVs, 4 DVD players, high speed Internet, and stereo/radio! Hi there! I am Judy Lombana Wren, owner (with my husband Bill) of Sandpiper's Nest, manager of several other oceanfront properties, retired university professor and mental health therapist, wife, mom, grandmother, and friend! Bill (a retired airline pilot) and I live in Ponte Vedra Beach, Florida and Maggie Valley, NC. I have been involved with with the ocean, beaches, homes, decorating, and people all my life. Sandpiper's Nest is our very special oceanfront home in which we take great pride and enjoy sharing with others. We hope you will love it as much as our previous renters do! I have been renting Sandpiper's Nest since I first bought it brand new in 1987. At the time, it was a two bedroom, two bath cottage on a fantastic oceanfront lot. Bill and I completely renovated the home in 1993, taking it to the studs, opening it more to the views and adding another bedroom and bath. It looks brand new because we are ALWAYS working on it...very important on the ocean! We bought two more oceanfront homes a few years later, and others starting asking me to manage their properties, so my rental 'hobby' quickly turned into a business. My son, David Lombana, has joined me in Wren Beach Rentals, and we now manages 25+ oceanfront homes in South Ponte Vedra and Vilano Beach. David now handles all except three. We take great pride in our solid relationships with both owners and renters, and we look forward to working with you! I bought Sandpiper's Nest in South Ponte Vedra Beach, because it was less than a half hour drive from my regular home, making it the ideal weekend retreat. I started renting it immediately, to help with the mortgage payments, and found that my renters also found South Ponte Vedra to be a very special community. It is perfect for vacationers who want direct oceanfront, great views, and privacy. Sandpiper's Nest sits on a 90 foot wide lot, on top of a high dune, offering panoramic ocean views. The immediate area consists of single family homes, several great restaurants, a terrific beach club (available as an option to our renters who want a pool!) and miles of wide, sandy, car-free beaches. Our renters come here because they love the privacy and the fact that we are not surrounded by high rise condos, fast food restaurants, bars, hordes of people vying for space on the beach, or cars driving on the sand! However, we are not isolated! Sandpiper's Nest is just 10 minutes from historic St. Augustine and 15 minutes from posh Ponte Vedra. We think we have the perfect beach location! Being a one level home yet having panoramic ocean views is quite unusual. Luckily, Sandpiper's Nest is built on a high dune which offers the practicality of single story living while enjoying fantastic ocean views and lovely sea breezes. We have found that "pet friendly" means just that. Owners of dogs take good care of their pets and we NEVER have issues with dogs...so if you are not a dog owner, don't worry...you will not have to deal with pet hair, odors, or anything else that would make living in a house where dogs have been. We have some amenities at Sandpiper's Nest that are not very interesting to mention, but believe me, we have learned the hard way that you will appreciate them. First, we have a double garage. Many potential renters don't consider that very important...but you will change your mind after scraping the salt off your car if it has been sitting outside for several days! We also have a water softener. The "beach water" is extremely hard and any house that does not have a water softener is just asking for serious problems, not only with etched glassware, but also with the pipes. Showers are so much nicer when the water is soft! We have duplicates of several things: two refrigerators, two washers, two dryers, two coffee pots, two blenders, etc. etc. We have learned that things get broken unintentionally and who wants to drive all the way to Target to buy a new coffee pot? We think you will appreciate these little nicites that we provide...we want you to have a wonderful vacation, and not having to worry about everyday issues is one way to insure it. And..just in case you DO have problems...Internet won't work, garage door opener seems to have a problem, TV is too complicated for us 70 year olds, don't worry...we have a property supervisor who can take care of just about anything that comes up! So...enjoy! The master bath has a spacious walk-in shower. The other two baths have regular tub/shower combinations. We are directly on the ocean and on a wide, sandy, car-free beach. We provide all bed and bath linens. We supply top quality linens, high thread count sheets, down blankets and pillows, with down alternatives available, as well. French door refrigerator with freezer below. Additional refrigerator/freezer in the garage. 2 Mr. Coffee 12 cup with auto-off. We supply filters. We have a lovely open galley kitchen with full size refrigerator, smooth top electric range, microwave, dishwasher, and more. We have a 12 foot wide deck that runs the length of the house and stairs to the seawall and the beach. we have one surf board along with lots of other water toys, boogie boards, etc. The house is all on one level so there are no stairs to climb. However, doorways are standard size. We consider pets on an individual basis with additional fees. We have a fenced yard, in addition to the enclosed deck, for pets. Sandpiper's Nest is direct oceanfront, on a lovely barrier island between the Atlantic ocean and the IntraCoastal Waterway. Since there are only single family homes and a few nice restaurants here, the beach is very private, peaceful, and quiet. No cars are allowed on the beach, and there are no high rises or fast food joints to interrupt your serenity. We do have several excellent restaurants and shopping for every day items within a five minute drive! The Serenata Beach Club, with its 3 huge pools, work out facility, and activities for children, is just a mile away. A fabulous nature park with trails is two miles away. In 10 minutes you can be in downtown historic St. Augustine with lots of attractions, great seafood, fun shopping, fishing and boating, many golf courses, including the World Golf Village, and more. In 15 minutes you can be in posh Ponte Vedra, with more great restaurants, shopping, and more golf! Day trips to Disney, Daytona Speedway, and Marineland are easy! Other Activities: dining, shopping, touring, shelling, kayaking, surf fishing, deep sea fishing, horseback riding, and much more. Golf: Golf courses abound in our area! The World Golf Village with its two fabulous courses, golf museum, and much more is a quick twenty minute drive. Numerous other public and semi-public courses are available both in St. Augustine and in Ponte Vedra.